RIO DE JANEIRO—The world’s indigenous communities need to be given a bigger role in climate stabilisation, according to a new study that shows at least a quarter of forest carbon is stored on communal land, particularly in Brazil. Having expanded indigenous land considerably since 2003, Brazil–and later Bolivia and Colombia–initially slowed deforestation. The World Research Institute estimates that tropical forests without such protection were two to three times more likely to be cleared. Photo on front page: Ashaninka girls walk through a forest path as they return to their village in the Peruvian Amazon. Source: Rodrigo Abd/AP. 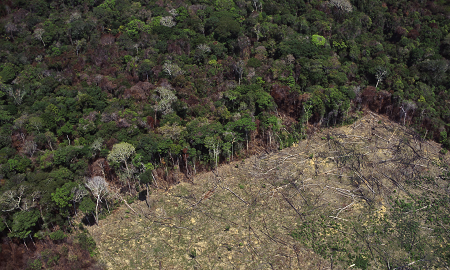 Photo on this page: Rainforest is cleared for agriculture in Amazonas state, Brazil. However, forest cover plays a vital role in rainfall levels and irrigation, which benefits farmers. Source: Brazil Photos/LightRocket via Getty Images.